Why a Cake of Cheese? 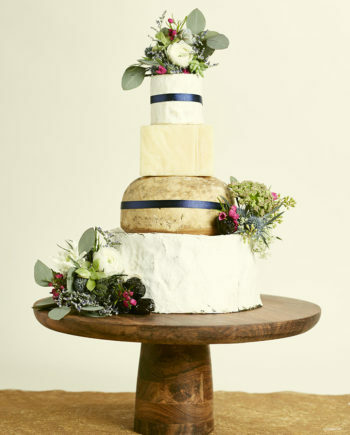 Fromagination’s Cakes of Cheese present a unique way to celebrate a wedding or other celebration. Wisconsin’s artisan cheese heritage gives our cheesemongers a wide variety of ingredients with which to create a cake that both feeds party-goers and celebrates a particular taste, culture and potential culinary theme. The size of your cake of cheese will be determined by its purpose, the number of guests you expect, and what sorts of cheese you prefer. Fromagination’s cheesemongers can create a cake of cheese for a small, core group for your rehearsal dinner, or a cake large enough to serve the appetizer course for a reception of several hundred. Cakes of Cheese may be created from fresh, soft cheeses such as Brie or Camembert, or hard cheeses such as an Alpine wheel. What’s most important is to choose cheeses that are both interesting and accessible to your guests. Discuss options for a wonderful cake of cheese – large or small – with our cheesemongers.